Hands up if you dream of a luxurious family-friendly villa in an enviable location with direct access to the sea? Confession: we do. Hands up if you dream of a luxurious family-friendly villa in an enviable location with direct access to the sea? Confession: we do. That's why we've found picturesque four-bedroomed Villa Tobias in beautiful Kas, a seaside town on Turkey's southwest coast. The modern villa comfortably sleeps up to eight and has steps leading to the calm crystal-clear waters of the Mediterranean. The villa exudes traditional Turkish style with stone walls and a terracotta-tiled roof. Take a cooling dip in your infinity pool or lounge in the sun or the shade on the terrace – a perfect place for families, couples or friends to while away the afternoon together. With coastal views so beautiful they'll distract you from your lengths, we'll forgive you for wanting to do nothing but relax. Inside, you'll find a modern open-plan living room and a spacious kitchen fitted with all mod cons. There's a dining area for eight and comfortable sofas for kicking back off after a day of exploring. From the living area, you can step straight out onto the terrace, dotted with potted plants and shrubs for a natural ambience, and there are plenty of sheltered spots for the shade seekers. The three doubles and one twin are set across two floors, and two of the doubles benefit from their own en-suite. Additional features include air conditioning, Wi-Fi as well as a washing machine for a hassle-free home-from-home stay. The decor is classic and contemporary with whitewashed walls, wooden furnishings and playful pops of colour in decor and traditional Turkish rugs. There are also rustic wood beams, stone wall features, and artwork adding a homely touch. With plenty of things to see and do in the area, Villa Tobias provides the perfect base for an unforgettable holiday. From your balcony you can enjoy show-stopping sunset views, you're steps from the sea, and are within driving distance of Kas centre with quaint streets lined with local restaurants, shops and houses draped in pretty bougainvillaea flowers, alongside vibrant Kalkan. 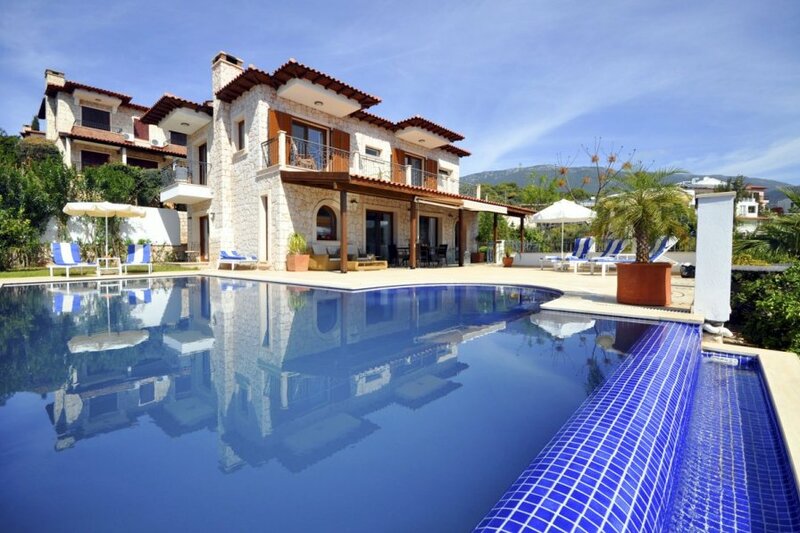 Villa Tobias is on the tip of Kas, a charming seaside town on the Mediterranean coast in southwest Turkey. From the villa, you're just steps from the sea where you can take a cooling dip in the crystal-clear waters or explore the rugged shoreline with coves and colourful sea life. It's built on the site of ancient Antiphellos, and you can still see visible ruins including a theatre. The beautiful town centre has whitewashed houses and buildings draped in bougainvillaea. You'll find plenty of local bars, restaurant and small streets lined with boutique shops. Every Friday there's a market, a short walk from the town centre, where you can buy everything from Turkish delight to fresh vegetables and handmade trinkets, and at night, the main square comes alive. From Kas, you can head to beautiful swimming spots such as Kaputas Beach, 18km west of Kas, with crystal-clear waters (it's where the fresh mountain water meets the sea) or Patara Beach, a 12-mile long stretch of shoreline that's also a National Park. Getting to both Kas is easy – jump on the local Dolmus bus. There's also the opportunity to take part in water sports like kayaking and scuba diving. Notable dive sights include a canyon, several reefs and wrecks, including two planes. By boat, you can visit the small island of Kekova where you can snorkel and explore the part-sunken ruins of Dolchiste, an ancient town which was destroyed by an earthquake. The Greek Island of Meis is also only a 30-minute boat trip away for a fun day trip. It's a great place to swim, eat and relax. You can also head to vibrant Kalkan Town, about a 30-minute drive from Kas where there are local bazaars, harbourside bars and rooftop restaurants offering a variety of delicious cuisine. Look out for Turkish specialities like gozleme (thin dough crepes) with cheese and spinach fillings. A local recommedation is the doner kebab place by the mosque, great for a lunchtime snack. For more outdoor exploring, there are lots of walking and hiking routes in the area. The best known, and arguably most scenic, is the Lycian Way – a 310-mile tying-together of goat tracks and paths, which will lead you to unspoilt beaches, lush forests and soaring peaks.